Guest vocalists make for a full house at Massey Hall show on March 21. 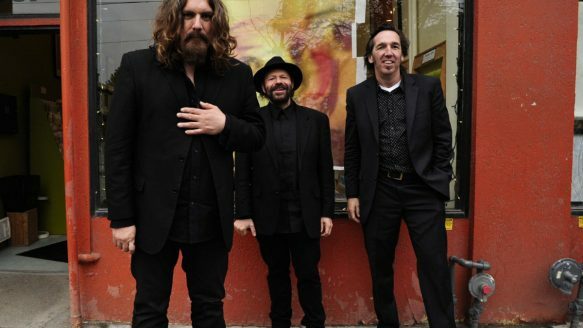 Blackie and the Rodeo Kings are, from left, Tom Wilson, Colin Linden and Stephen Fearing. Blackie & The Rodeo Kings will have a few of their queens on hand with them when they perform at Massey Hall on March 21. Holly Cole, Serena Ryder, Amy Helm and Mary Margaret O’Hara are expected to join the respected Toronto trio of Tom Wilson, Colin Linden and Stephen Fearing for their first ever date at the venerable venue, and Wilson is hoping a few surprise guests also show up. “I’ve certainly put out feelers, so everyone has been asked,” said Wilson recently from his Hamilton home, about the celebration surrounding the band’s latest effort, Kings And Queens. For the roots-friendly recording, the trio — largely at the behest of Linden, who resides in Nashville — manage to procure duets with Lucinda Williams, Patti Scialfa, Emmylou Harris, Pam Tillis and others. But don’t expect Harris to be among the potential surprise guests. Wilson says that although the project was finished last year, it took quite awhile to nab everyone for duets. “Actually, it took six years from start to finish,” he laughs. Initially starting as a spiritual tribute of sorts to fellow musician Willie P. Bennett, “Blackie And The Rodeo Kings” is one of the late venerable folksmith’s best-known songs, the trio has released six other exceptional albums that have made critics list, but haven’t been the greatest sellers. “I wish people knew more about us,” laments Wilson, who like the other two members, has either solo or production careers that demand a lot of time away from the trio. Be the first to comment on "Blackie & the Rodeo Kings have queens up their sleeve"